The result of a third cleavage event, the 8-cell embryo begins a process of compaction, wherein the round and loosely connected blastomeres assume a flattened polarized cell morphology. The outer cell surface becomes convex and the inner surface becomes concave, due to differential adherence patterns between the cells' inner and outer surfaces. The 8 cell stage (actually consisting of 6-12 cells) develops by day 3 of human embryonic development, and includes a continuation of the process of embryonic genome activation (which is initiated at the 4-8-cell stages of the human embryo), resulting in the morula. In the mouse embryo, the 8-cell stage time corresponds to E2.5 whereby the third cleavage event is completed resulting in a 2-cell embryo. 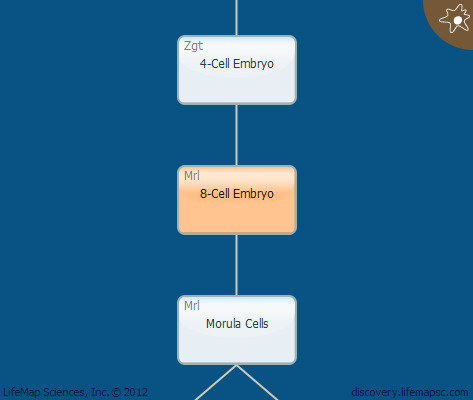 Subsequent cell divisions give rise to the 16 and 32 cell stages called the morula, which occur between E2.5-3.5.